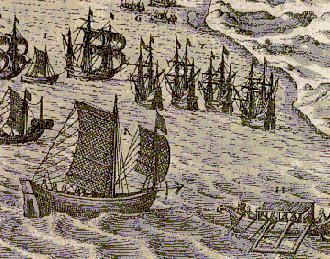 On May 2nd, 1511, Alphonso d'Albuquerque sailed from Cochin, India, for Malacca with nineteen ships, 8oo Portuguese and 6oo Malabaris. After sinking Muslim shipping en route and raiding Pasai and Pedir, he reached the harbour of Melaka on the evening of July 1, to the sound of trumpets, cannons and bedeckked with flags. Sultan Mahmud sent a messenger to enquire whether it was to be peace or war. d'Albuquerque, demanded the surrender of the captive Portuguese from de Sequeira's fleet and compensation. The Sultan erected stockades decked with war flags and made a show of his fleet of river-boats. d'Albuquerque bombarded the town, which terrified its inhabitants, being the first time it had ever been shelled by modern heavy artillery. 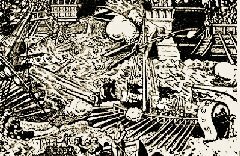 With fires blazing in many parts of the town, he then set his cannon on the ships and burnt every one, except for those belonging to Chinese and Hindus. In desperation, the Sultan surrendered the Portuguese prisoners and agreed to some of his demands for compensation - even agreeing to a Portuguese fortress being built near Melaka. But after seeing the wealth of trade in the harbour and the splendour of the city, the Portuguese had by now no intention of letting Melaka be ruled by anyone else other than themselves. d'Albuquerque tested the Malay stockades by ordering a small raid with armed boats and two barges with heavy bombards in order to discover the enemy's numbers, where their artillery was stationed and how they planned their defence. The defections already began. The Chinese merchants offered the services of their crews and their five junks. d'Albuquerque learned from them that the Sultan had more than 20,000 fighting men in the town - most of them Javanese, Persians and Turkish mercenaries. There were also twenty war-elephants and at least 3,000 artillery pieces - though almost all of them were small-calibre guns with little range and firepower. Melaka was divided into two by the Melaka river. The northern part of the town housed the commercial quarters where the Javanese, Indian and Chinese merchants had their godowns and homes. To the south of the river was the Royal Quarter where the Sultan had his Palace, his Royal Household and the city's main mosque. A single bridge near the mouth of the river linked the two parts of the city and both sides knew that the Malays losing that bridge would effectively split their forces in two. Whoever held the bridge would hold the city. 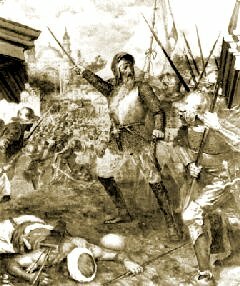 Devoted to the Apostle James, d'Albuquerque mounted his first major assault on that Saint's day - July 18. He ordered half his forces to disembark south on the side of the mosque, while he led the other half ashore on the north or city side. As morning broke, the attack on the bridge began. As soon as the first fury of the Malay artillery was spent, the trumpets blew and with the war-cry "St. James!" the Portuguese fell upon the Malay stockades on the bridge. The Sultan's forces charged at them with bows and arrows, blow-pipes and lances and shields. The battle ebbed and flowed over that bridge for most of the morning - the Malays withdrawing, pursued by the protuguese, then the Portuguese retreating as their rear flank was attacked by waiting Malays in the sidestreets and alleys of the main road leading up to the mosque. At a crucial point, the Sultan and his son, Ahmad, mounted on war-elephants and led yet another drive which drove the Portuguese back to the bridge - but they were pushed back again by another charge from Portuguese pikemen. Seven hundred Javanese then attacked the Portuguese rear from the northern part of the city but they were scattered before they could reach the stockades on the bridge. Some fleeing Javanese jumped into the sea only to be slaughtered by Portuguese in boats. Reinforcing their position in the stockades, the Portuguese threw back another assault by the Sultan war elephants, stabbing them with their lances so that they turned tail and charged through the Malay ranks. Ahmad had his own elephant killed under him and was wounded in the hand. By 2 p.m. the Portuguese had advanced up to the mosque and large parts of the city were already set to fire. But the Portuguese attack was spent. They had many killed and wounded, they were suffering greatly from the heat and they were exhaused building stockades and fighting off counter-attacks. At dusk d'Albuquerque withdrew in boats, under the fire from Malay guns, matchlocks, spears, arrows and blowpipes. He took away with him at least fifty large bombards captured from the Malay stockades, and seventy of his wounded Of those struck by poisoned arrows, only one survived. The Malays now repaired the stockades on and around the bridge and redeployed most of their artillery there. The bridge was divided into sections with stout palisades and two more palisades were constructed on the river banks mounted with guns to command the approaches to the bridge from city and mosque. The leader of the Javanese mercenaries, Utimutira, had by now decided to throw in his lot with the attackers and sent presents to d'Albuquerque, promising him secret support. d'Albuquerque now heavily armed a very tall junk that would overlook the bridge and ran it aground on on a sand-bank, where, like a seige tower, it rained artillery fire, crossbow arrows, darts, fireballs and stones onto the the Malays on the bridge for nine days. The Malays sent down barges of firewood, pitch and oil on the falling tide to set the junk on fire, but these attempts failed to destroy it. Two hours before dawn on Friday August 8th, the day of the martyr St. Lawrence, the Portuguese again set out for the city on the high spring tide. While the junk was being grappled and secured to the bridge, two Portuguese boats with heavy guns took up positions on both sides of the bay, to protect with their fire the flanks of the Portuguese attacks. d'Albuquerque with all his remaining force landed on the north or city side of the river in the Javanese quarter of Upeh. Having secured a bridgehead there, he ordered a force of his soldiers to seize the mosque while another was ordered to capture the Malay barricade that blocked the main street in the south. 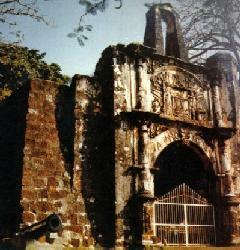 The Portuguese stormed the bridge, the Malays withdrawing to the stockades between it and the mosque. These stockades were soon engulfed by gunfire from the boats, and the defenders retreated to the mosque, where was the Sultan and 3000 shieldsmen were entrenched. All through the night the gun-boats and warships in the bay bombarded the city. But it was needless. Sultan mahmud had by then gathered all the treasures in his Palace and fled with his family and followers. Melaka had fallen. The next morning, the Portuguese advanced towards the Sultan's Palace, only to find it deserted and emptied of the loot they had been promised. Enraged, they put the palace to the torch and, for the next few days, looted the city. The mosque was demolished stone by stone - the material being used for the new Portuguese fortress that was to be built upon the site of where the Sultan's Palace had originally been. The fortress - A Famosa - preserved Portuguese power in Melaka for the next 130 years. 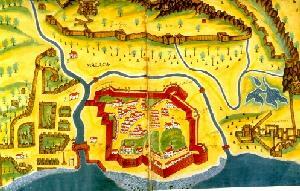 It had taken exactly 40 days for the Portuguese to put an end to the Melaka Empire. The Sejarah Melayu website is maintained solely by myself and does not receive any funding support from any governmental, academic, corporate or other organizations. If you have found the Sejarah Melayu website useful, any financial contribution you can make, no matter how small, will be deeply appreciated and assist greatly in the continued maintenance of this site.